Bella was brought to O’Sullivan Animal Hospital at the end of May because a concerned individual found her severely injured in a local park. They knew she needed prompt medical attention and that O’Sullivan Animal Hospital always as a veterinarian on site to address any emergent situations. 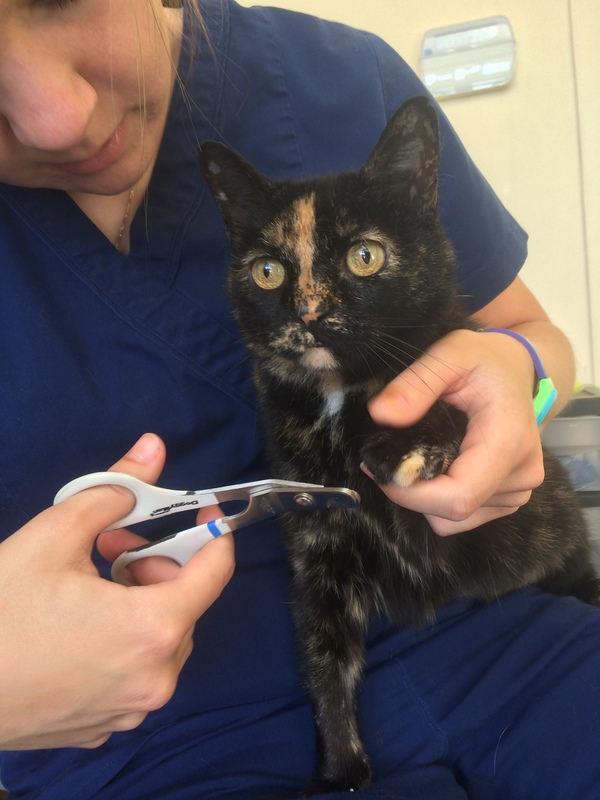 Upon arrival to the hospital Bella was scanned for a microchip in attempts to contact her owners – unfortunately Bella did not have a microchip at the time, and with no other form of identification we were not able to contact her family. But Bella needed medical attention fast for her injuries, and from the onset was such a sweet and lovely lady, that the team at O’Sullivans reached out to Dr. Trish O’Sullivan to see if there was anything that we could do to help this special girl out while we tried to find her owners. Fortunately for Bella, in special circumstances, O’Sullivan Animal Hospital does have the capacity to perform charity work. Generous donations from clients along with adoption fees from rescues through the hospital are saved for cases just like Bella’s. So the team set to work – assessing the extent of her injuries and working hard to save Bella’s life. We’ll never know exactly what happened to Bella (We’ve tried asking her but her lips are sealed!) but we suspect either an animal attack or vehicular trauma. Regardless, she needed help and fast! On further examination Bella had suffered extensive trauma to her hind end, had a severe abdominal hernia (breakdown of the muscles of her body wall and associated soft tissues) and also had several broken ribs. Dr. Chen performed surgery that day to repair the hernia and reconstruct the muscle damage that was present, and after that long and complicated surgery Bella was on her long road to recovery. Initially this sweet girl was in a great amount of discomfort given the extent of her injuries – fortunately for her Dr. Prost, Dr. Watson and Dr. O’Sullivan formulated a strong pain management protocol for her, involving local anesthetic blocks, constant rate infusions of pain medications and specific oral pain medications to address the suspected nerve pain present in Bella’s hind end. While the Health Care Team at O’Sullivan worked to fix Bella – we were also on the search for her family! Bella did remarkably well after her surgery, but it was evident after she fully recovered from general anesthetic that she had had some severe nerve trauma to her back legs. Initially it was all she could do to sit up, and while she was comfortable, she could not stand or use her back legs well. But the O’Sullivan Animal Hospital team did not give up hope! While we continued to search for Bella’s family by sending pictures to the OSPCA and Animal Control we also set about working on Bella’s mobility. Dr. Watson alongside many of the Registered Veterinary Technicians at the hospital worked with Bella, several times a day initially, to help her regain function of her legs. They started with encouraging movement of her joints, and attempting to prevent loss of muscle mass, with gentle stretching and movement exercises, and once Bella was strong enough they moved on to balance and proprioception work. The team basically had to teach Bella how to walk with her back legs again, with special emphasis on building back the strength she had lost and showing her how to place her feet properly. Most importantly – this story has TWO happy endings! While we were working on rehabilitating Bella from her trauma, we were also able to locate Bella’s family! After lots of hard work from Bella (she works very hard and really seems to enjoy her rehab sessions) and everyone at the hospital Miss Bella was able to return to her family that had worried endlessly about her since her disappearance. Now, weeks after she first arrived on O’Sullivan Animal Hospital’s doorstep, Bella is continuing to work tirelessly at her rehab, and hasn’t looked back! Her level of comfort has dramatically improved, and while she still doesn’t walk normally in her back legs (Yet! ), her mobility has improved by leaps and bounds, especially considering that following her surgery she couldn’t even stand on her own. Her family is working hard at keeping her inside, and is SO thankful to have been able to be reunited with their very special girl. The textured surface of this balance disc helps Bella hold her feet properly underneath her. Such focus while balancing on the FitPaws Peanut! Rehab is hard work! Lucky for Bella she gets lots of yummy treats for her hard work! We look forward to keeping you all updated on Bella’s progress – everyone LOVES a happy ending! Update: Bella’s Mom also decided to have Bella microchipped yesterday following her rehab session. They are a permanent form of identification that can be placed at any time! This tiny microchip (about the size of a grain of rice) stays under the skin on the back of your pet’s neck, and if at any time your pet becomes lost, veterinary clinics and shelters can use your pet’s Microchip number to contact the company (24 hours a day, 7 days a week) to reunite you with your pet! A quick and permanent solution that could save you hours of grief and worry if your pet should ever go missing, and possibly save their life should they suffer an accident while lost without you! You can read more about Microchips here and here. Or Call O’Sullivan Animal Hospital, 705-728-8387 and we’d be happy to answer any questions you may have!